The poems and literary work of South Dakota’s first poet laureate, Badger Clark, will continue to be available for future generations, thanks to the merging of organizations dedicated to keeping history alive. The Badger Clark Memorial Society was created in 1984 to preserve and distribute Clark’s works as well as to preserve the Badger Hole. 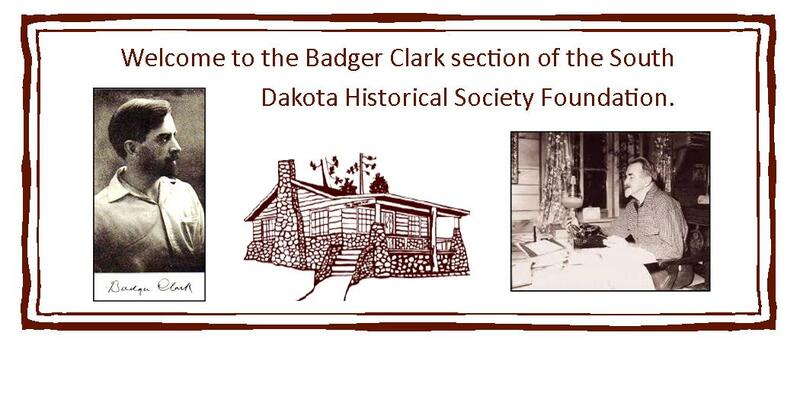 The Badger Clark Memorial Society has merged its operations into the South Dakota Historical Society Foundation, the nonprofit partner of the South Dakota State Historical Society at the Cultural Heritage Center in Pierre. The foundation will oversee the reprinting and distribution of Badger Clark’s five volumes of work as well as other materials about Clark. In addition, the foundation will continue the Badger Clark Memorial Society’s work of partnering with Custer State Park officials to manage Clark’s home, known as the Badger Hole. The Badger Hole is located in Custer State Park and open to the public from Memorial Day to Labor Day. Clark was named South Dakota Poet Laureate in 1937, but he preferred the nickname “Poet Lariat.” As the poet laureate, Clark produced several books as collections of his works. The earliest, “Sun and Saddle Leather,” was published in 1915. The novel “Spike” was published in 1925, with “Sky Lines and Wood Smoke” following in 1935. “Boots and Bylines” and “When Hot Springs was a Pup” were printed after his death in 1957. Clark is most remembered for “A Cowboy’s Prayer” and “Ridin,’” which were widely published. Clark’s poems and books are available at the Badger Hole and the Heritage Stores in the Cultural Heritage Center and the Capitol, both in Pierre.